This recipe was originally published in February of 2018. It has been updated. Buttery and warm mashed potatoes with hickory smoked bacon, caramelized onions and tender cabbage is one of our new family favorites.Make this. Like, right now. You don’t have to be Irish, and it doesn’t have to be St. Patrick’s Day. 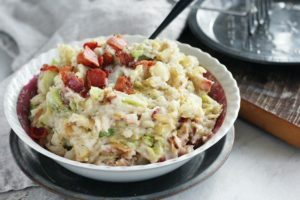 Our take on the classic Irish Colcannon recipe is so good you’ll wonder why you haven’t been eating it your whole life. Wait, what? You have been eating colcannon all your life? Then I’m totally mad because you didn’t tell ME about it. Amazing recipe. So simple but so satisfying. I have recently been on a personal journey to try traditional Irish recipes. Things like Irish Stew, Soda Bread, and anything with a good stout beer in it. Just when I thought I had eaten every version of potatoes + cabbage + bacon. Then this. Talk about such a wonderful, homestyle recipe that your family will love. Filling and comforting…buttery and savory. All of the great things about simple country cooking combined into one fantastic recipe. 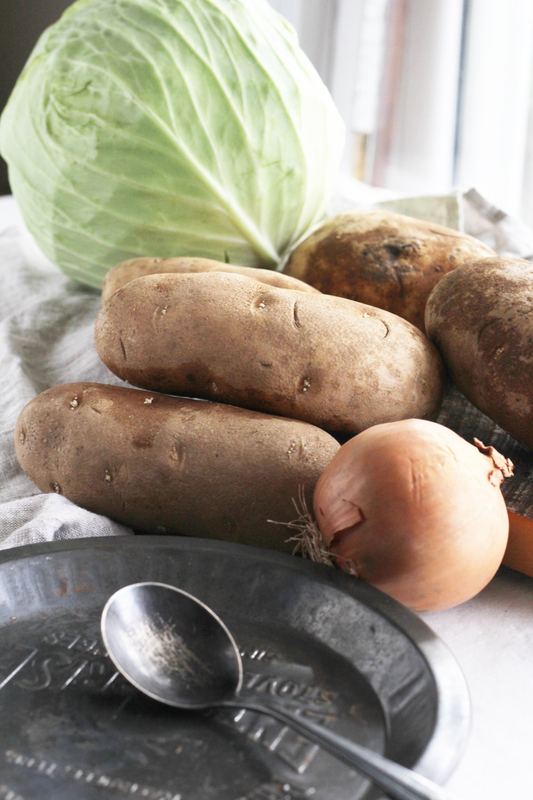 To make our version of a traditional Irish Colcannon recipe, you start with affordable ingredients. Russet potatoes, green cabbabge, and onions. These household staples are at the heart of many of our recipes, including this colcannon recipe. Place the potato chunks in a large pot and cover over 1 inch with cold water. Heat to a low boil and cook until the potatoes are easily pierced with a knife. Drain the potatoes, and return to the cooking pot. Then set the pot of potatoes on the stove eye (that has been turned off) for a minute or two to dry the potatoes. Remove from the eye and add the butter, milk, salt and pepper. 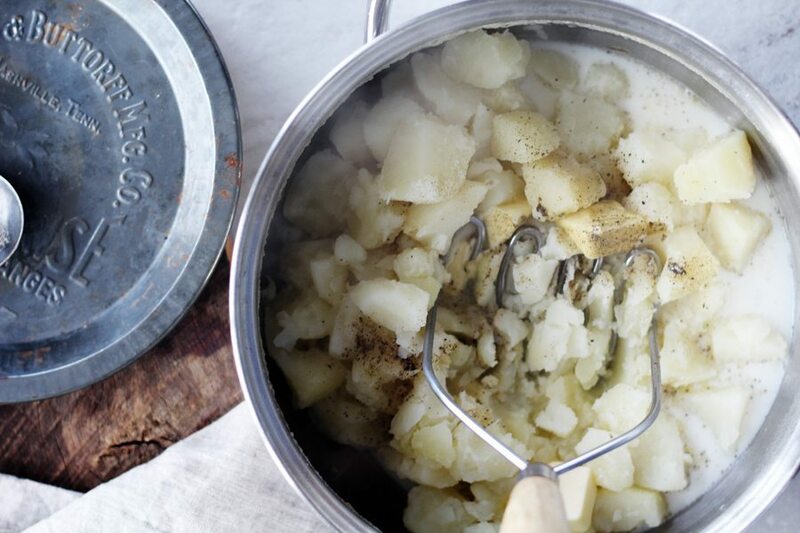 With a fork or potato masher, mash the potatoes until lumpy. Set aside. While the potatoes are cooking, cook the bacon pieces in a 12 inch cast iron skillet over medium heat until browned. With a slotted spoon, transfer the bacon to the mashed potatoes. Reserve the bacon drippings. In the same skillet, cook the sliced onions in the bacon drippings until golden and caramelized. Stir frequently and reduce the heat as needed to prevent burning. This will take about 5 – 7 minutes. Add the chopped cabbage to the skillet with a pinch of salt and pepper if desired. 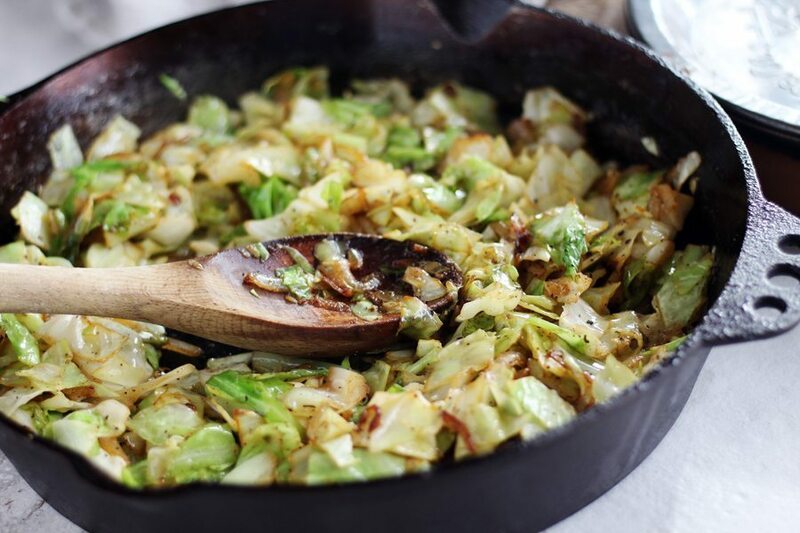 Stir the cabbage and onions together, and cook and stir until the cabbage is tender, about 10 – 15 minutes. Fold the cabbage and onion mixture into the mashed potatoes and bacon. Stir to combine well. Finally, serve hot with additional butter if desired. First things first, make your favorite mashed potatoes. Get our recipe at the end of this post, or use your own. A classic buttery mashed potato base is the main part of colcannon. After all, it is an Irish recipe. Leave it to me to turn an Irish recipe into something decidedly Southern by adding hickory smoked bacon. I mean, adding bacon to a potato recipe is a no-brainer in my book. The instant addition of savory-smoky flavor to this colcannon recipe is perfection. Be sure to save all of those bacon drippings. We are going to infuse all of that piggy bacon flavor into our fresh onions and cabbage. Speaking of the onions, let’s caramelize them first. Sure, you can cook them all at once with the cabbage if you want…but all you are going to get is cooked bland onions. Let the onions simmer and caramelize in the bacon fat until golden for another layer of flavor that will set your recipe apart from anyone else’s. Cook and stir until the cabbage is tender and still firm. Do not add any liquid because you want the cabbage to “wilt” and then brown a little, not to turn to mush. This way every bite of Irish Colcannon has that lovely flavor and bite to it. To finish the recipe, fold everything together. Taste and add more salt and pepper to your personal taste. Remember, the bacon adds a layer of saltiness, so don’t get carried away. 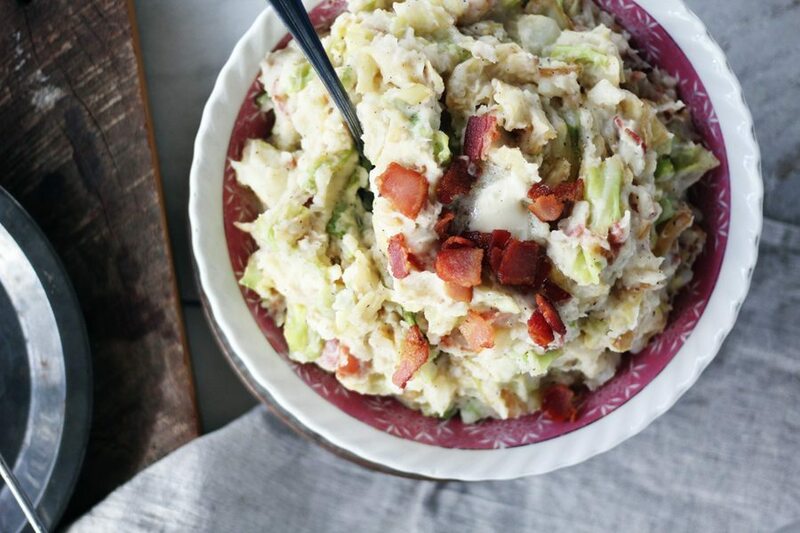 The buttery mashed potatoes, salty bacon, cooked cabbage and onions…mix them all together and top with extra butter. 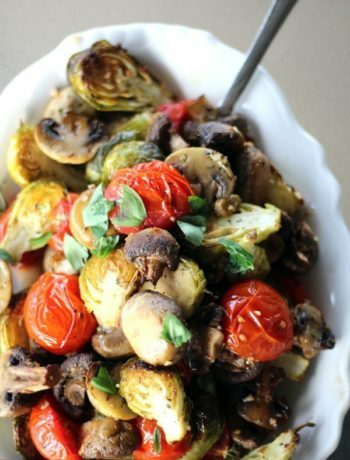 Serve hot with your favorite main course for an unforgettable side dish. 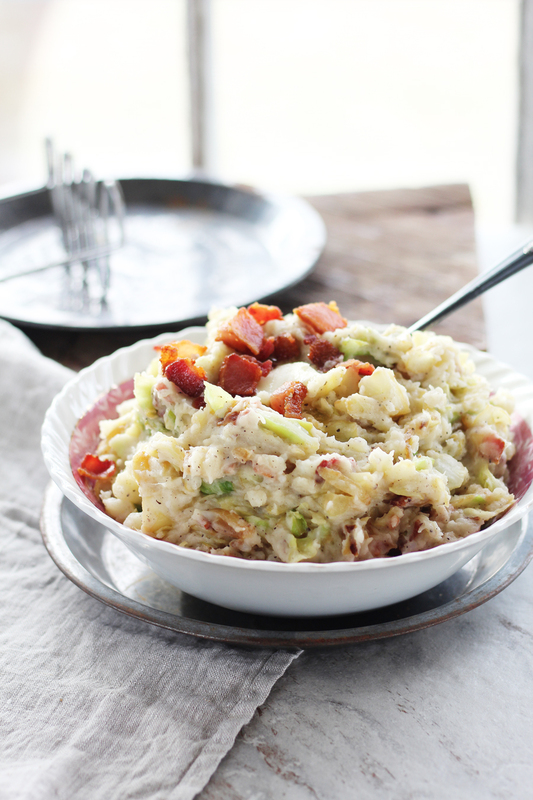 Your family will beg you to make Irish Colcannon with Bacon again (and again). This is our take on a traditional Irish Colcannon recipe. 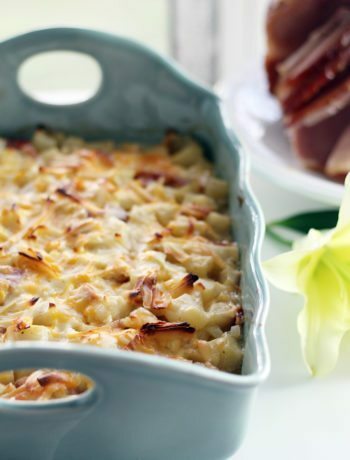 Buttery mashed potatoes with hickory smoked bacon, caramelized onions, and tender cooked cabbage. So. Simply. Good. Set the pot of potatoes on the stove eye (that has been turned off) for a minute or two to dry the potatoes. Remove from the eye and add the butter, milk, salt and pepper. With a fork or potato masher, mash the potatoes until lumpy. Set aside. 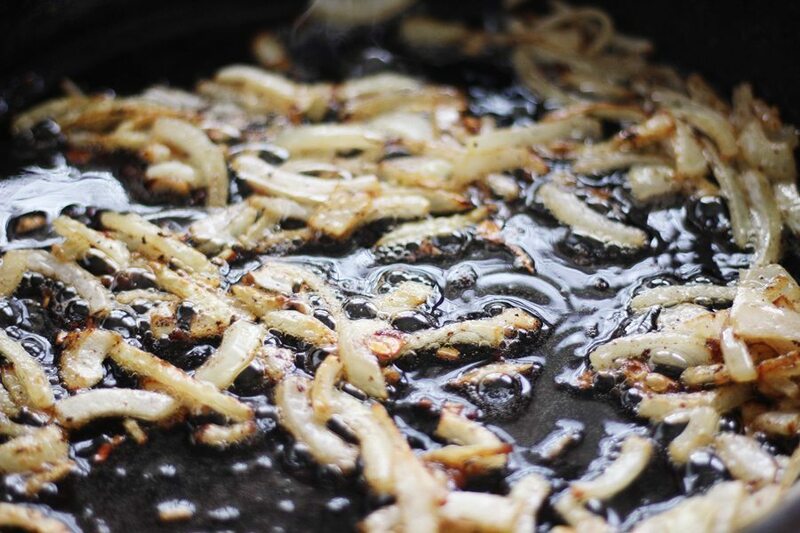 In the same skillet, cook the sliced onions in the bacon drippings until golden and caramelized. Stir frequently and reduce the heat as needed to prevent burning. This will take about 5 - 7 minutes. Add the chopped cabbage to the skillet with a pinch of salt and pepper if desired. Stir the cabbage and onions together, and cook and stir until the cabbage is tender, about 10 - 15 minutes. Fold the cabbabe and onion mixture into the mashed potatoes and bacon. Stir to combine well. Serve hot with additional butter if desired. Oh wow! 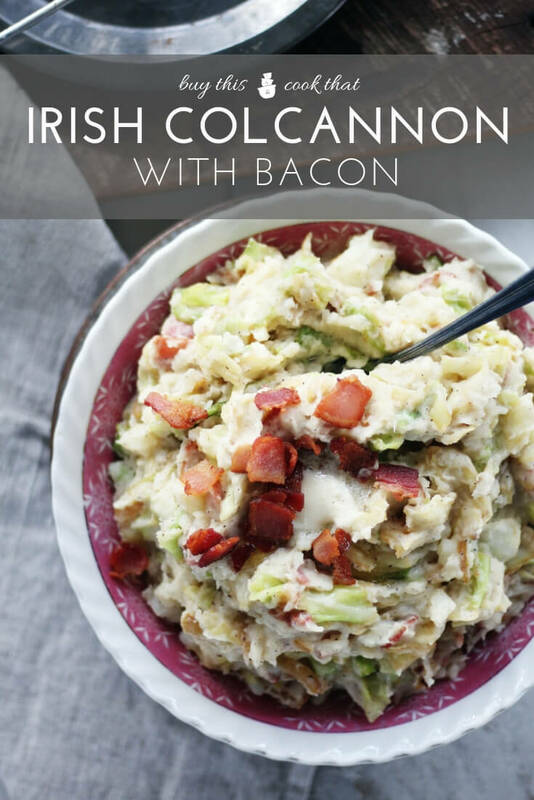 I have never heard of colcannon but this sounds delicious! 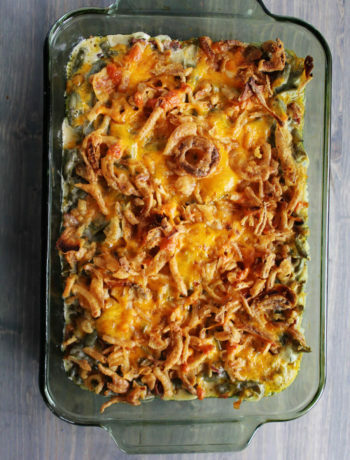 Love the addition of bacon to add a Southern touch to an Irish dish. Will try this soon for sure! It is sooooo good. One of those comforting classic foods. Omg comfort food heaven, literally drooling here!! Listen, my family was crazy over this. So simple and affordable, too. It just occurred to me that the “corned beef hash” I made yesterday — with shaved brussels sprouts — is more like a colcannon hash… I’m going to have to change the name. This looks delicious! This would be divine with brussel sprouts. I’ll have to check out your corned beef recipe. My husband loves it.